Inside: Make A Sour Patch Kids Cake post has been sponsored by Albertsons Companies family of stores. All thoughts and opinions are my own. We are still working our game board for the SHOP, PLAY, WIN!® Collect & Win Game featuring MONOPOLY at Safeway. Have you started playing yet? If not, there is still time! One tip we’ve found is to combine new products we hadn’t thought of before for extra chances to win on your next shopping trip to Safeway. 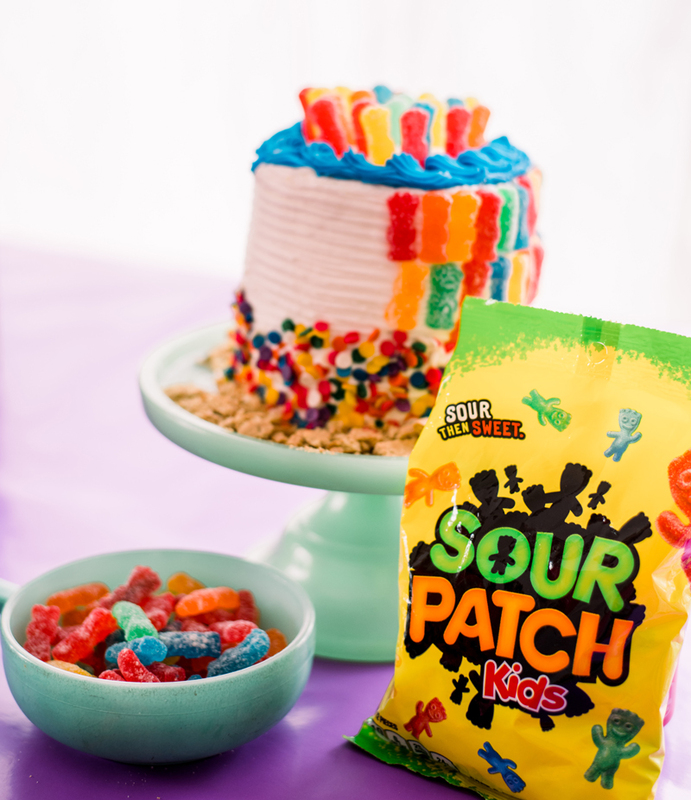 That’s how we came up with this Sour Patch Kids Cake. Wacky combinations can lead to a winning game board. 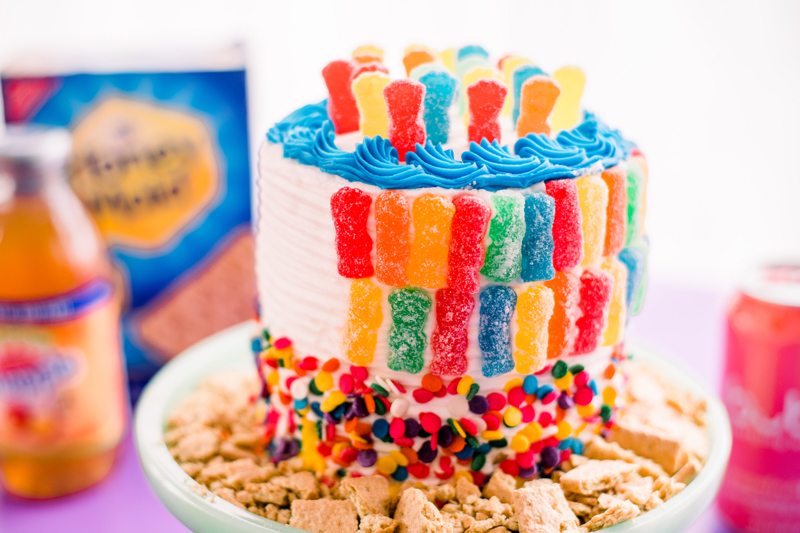 Trying out new products for more chances to win is how we came up with this fun idea of a Sour Patch Kids Cake! My kids are in love with the sweet & sour taste of the candy. I found that when combined with frosting and cake, the result is amazing! 1. To make the cake, start by mixing up your favorite cake recipe. This is an easy time to grab a recipe from a box for ease or here’s a favorite one we’ve loved before. 2. For an extra sweet taste, place some of the Sour Patch Kids into the cake batter, they melt down while it bakes and will add caramel-esque moments in the slices. 3. Once the cake is baked and cool, frost and chill for at least 2 hours. Meanwhile, break up the graham crackers to make the bottom cake dirt. 3. 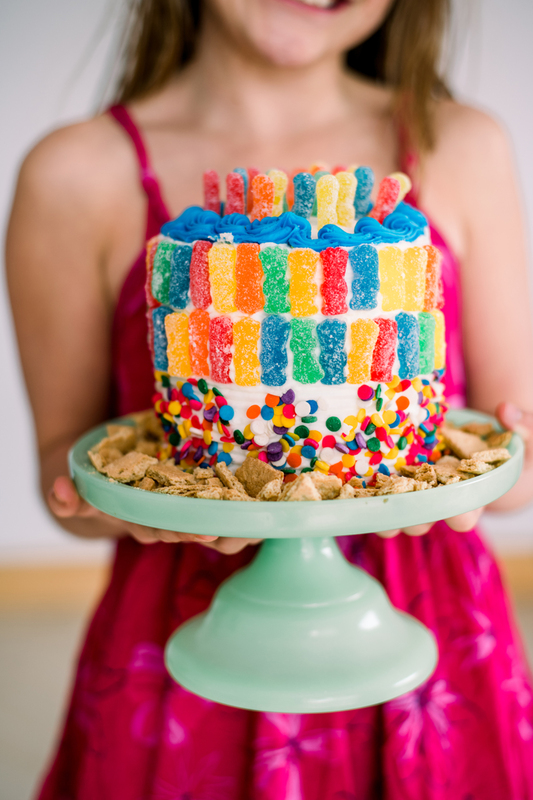 Begin to fill in the cake with the Sour Patch Kids candy. We used about 3 packages to cover our full cake, interspersing it with sugar confetti for a fun party look that combines some of our favorite things. That is a cake that easily wins all the awards in my book! 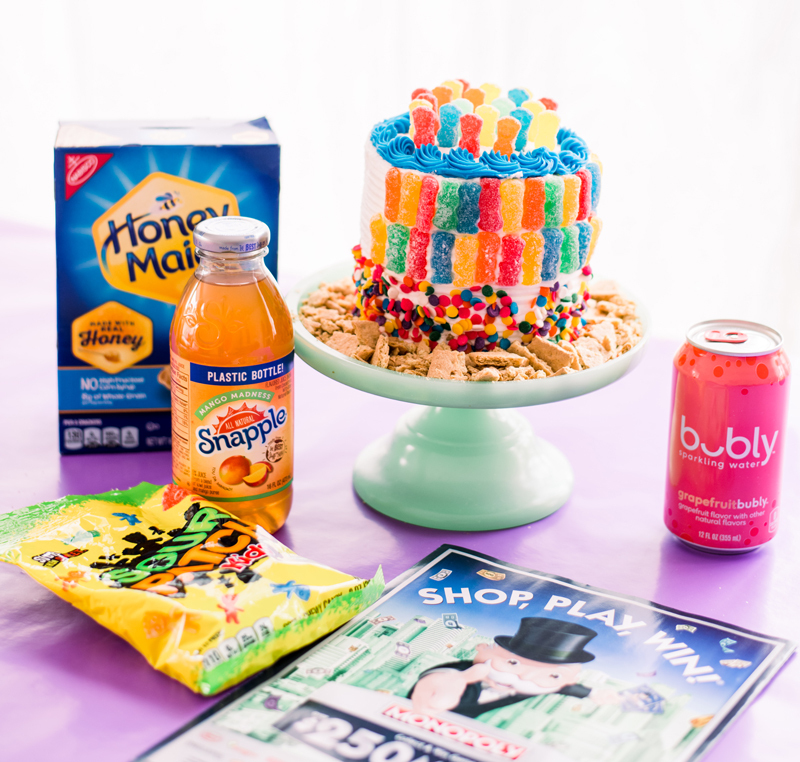 You could replicate this idea with almost any candy (although the sweet/sour taste of the Sour Patch kids is really fun to try) or make a cake our of full candy boxes like we did in our candy cake post. 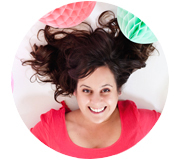 What new treats and products might you want to try? 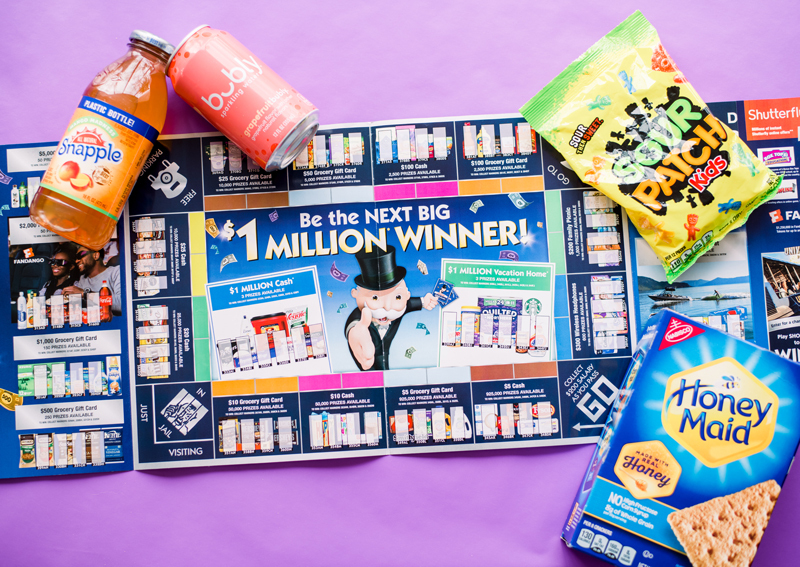 It’s easy to try them all and win with The SHOP, PLAY, WIN!® Collect & Win Game featuring MONOPOLY. Have you tried out the MONOPOLY App yet? It’s online and the easiest way we’ve been able to play the game. 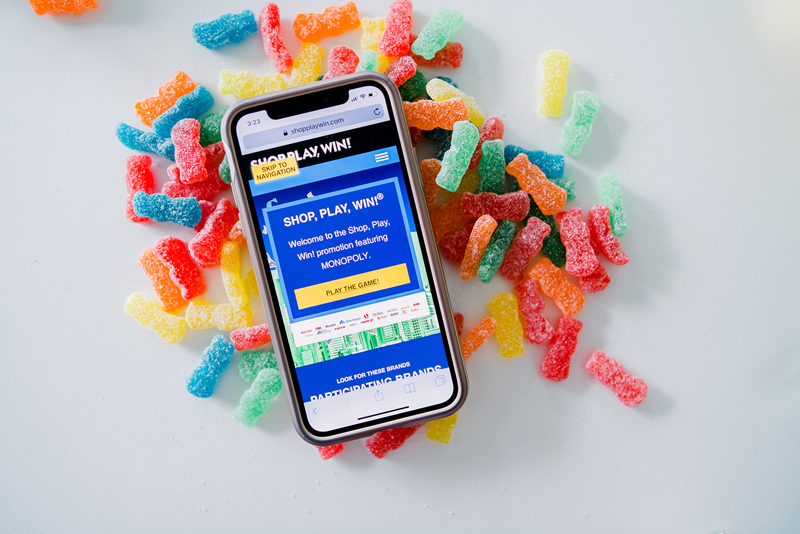 I play the MONOPOLY Collect & Win game at my local Safeway, but you can Shop, Play, Win! at any of the Albertsons Companies stores like Albertsons, ACME Markets, Jewel-Osco, Pavilions, Randalls, Tom Thumb, Shaw’s, Star Market, Carrs/Safeway, United Supermarkets, Amigos, Albertsons Market, Vons and Market Street stores.